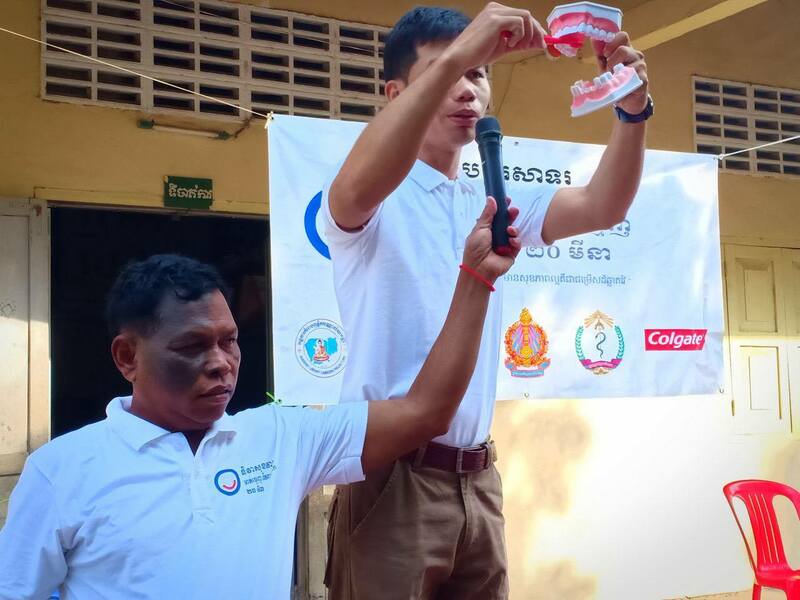 On 19th March 2019, BLCP Dental Clinics for Children in the three provinces – Kampot, Takeo and Kampong Speu celebrated the World Oral Health Day. During this event, BLCP dentists and dental assistants demonstrated how to look after and brush teeth properly and gave good messages about dental health care to more than a thousand children at three schools. These events were made possible with the support from Cambodia Dental Association (CDA) and Colgate Company. We would like to express sincere thanks to Colgate and CDA for the donation of 50 boxes of toothpaste and brushes for this event. Each box contained 288 kits of toothpaste and brushes and therefore 50 boxes contained 14,400 kits. On the 28th of February, 2019, BLCP Management Team and Staff in Kampot Province celebrated a Buddhist Ceremony for the late Paget Sayers, BLCP Founder. After the ceremony, his ashes were interred at a beautiful shrine next to the new center he built before he passed away. May him attain in Nibbana! Sadhu! Sadhu! Sadhu! Annual Inter-School Debating Competition 2019. 1)- Alcohol should be banned at wedding parties. 2)- Parents are the most important persons to make children learn well. The teams from both BLCP and Kep Gardens did a very good job coming up with very good ideas to support their topics and the debates went smoothly. The result was that BLCP won the first debate and Kep Gardens won the second debate. The 4 teams from both schools were equally poised as in the last year, finishing with a 1-1 result. 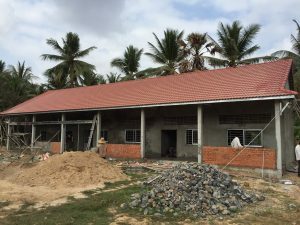 Thanks to Australian donors, a brand new 3 classroom building is under construction at the Steung Keo Secondary School in Steung Keo commune, Toek Chhou district, Kampot province – about 30 minutes drive from the town. The building will be gifted to the children in the Third week of March 2019. The school costs 36,000 USD and it is jointly funded by Lean Lee, her friends of Club Karuna and Buddhist Library Cambodia Project. The funds were raised through personal contributions made by the members of Club Karuna and a raffle jointly organized by Association of Engaged Buddhists in Sydney and Club Karuna. 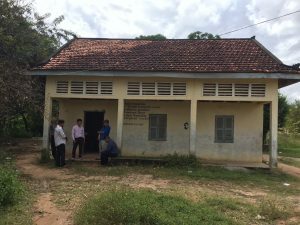 This is the second school building to be funded by Club Karuna, the first being a building for Boeng Touk Primary School. 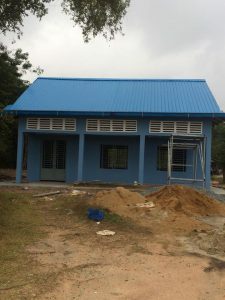 With this new addition, YOURAID has so far built 4 buildings of 13 classrooms that include Ranaridd High school and Murry School in Kampot province. Also, we jointly contributed to the construction of 3 more school buildings. A group of dental students from Griffith University Australia, Stephanie Yue Sum Liu, Alex Simon Chan, Jennifer Thanh Mai Tran, and Jonathan Yu Hao Wong volunteered at our clinics for over two weeks. Youraid and Buddhist Library Cambodia Project would like to extend sincere gratitude to the group for their time, and the valuable dental materials they have brought for our clinics. We now have a list of volunteers lined up for 2019 to volunteer in our clinics. If you are a dentist, dental nurse or assistant and have an interest to volunteer in our clinics please go to www.youraid.org.au/volunteer and send your interest. 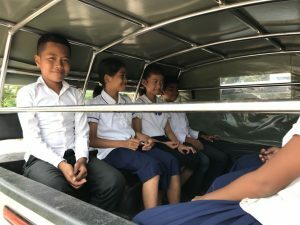 For more than 10 years, YourAid has been serving Cambodian children who need assistance in health care and education and giving them the opportunity to stand out on their own in the future. In that time, we have joined together with individuals, groups, and organizations in Australia who are committed to standing alongside the poor to tackle poverty. Club Karuna, CLUB 500, Dr. Serge Bodlander, Dr. Tony Cruickshank and One Child Group (Anna Idzikovska group) are a few to be named. In 2018, Club KARUNA has raised funds for classrooms for 2 remote schools at a cost of over US$40,000. Youraid completed the constructions of one of the buildings and handed it over to the school. The construction of the 3-classroom building will start soon. Jasmine Derbidge of CLUB500 has been supporting BLCP education projects, especially our mobile libraries in the last 3 years. Club 500 has completed wash and tooth brushing facilities at remote schools, building a preschool in a remote province, mobile computer classes, new houses for poor families, reading glasses for students, and their yearly Christmas Bike and Food Package. The One Child Group (Anna Idzekovska group) has been running mobile computer classes in outreach schools since 2017. The project gets support from their donors to support the salary of the teacher and to pay for the fuel for the motorcycle. All the laptops are donations by various Australian donors. Youraid along with Buddhist Library Cambodia Project facilitated implementation of all these projects and continuing. 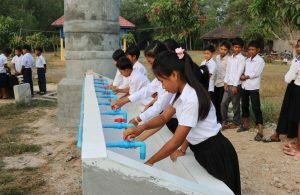 The Cambodian Ministry of Education is rolling out a programme to provide hand washing facilities for the schools in Cambodia. Even before this initiative by the government, BLCP has been building hand washing facilities for schools along with the water tanks. If your organization is interested in supporting this programme, we would like to hear from you. The cost of the hand washing facility is approximately $900 and you can fund 50% of the cost as the balance will be contributed by the school’s Parent Teacher Association in the form of labor. If your organization has a project in mind that directly helps primary and secondary school children on education or health, or would like to start a mobile computer class, please email us. This should be a long-term commitment for at least for 2 years. Your organization can donate a school building or school library to an outreach school. What happens after you make your request? 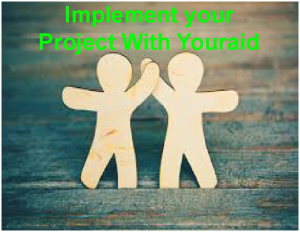 Youraid will assign your project to the BLCP and all the details, location, cost and the implementation plan will be communicated to you. If it is a construction of a building, library or a handwashing facility, the plaque will include the name of your organization. If the project is of a complicated nature, you will have to provide guidelines to us and it will be implemented appropriately. All your monetary contributions will be accepted with a receipt which is tax deductible in Australia. Youraid pays for administration costs and all your donations go to your own project in Cambodia. 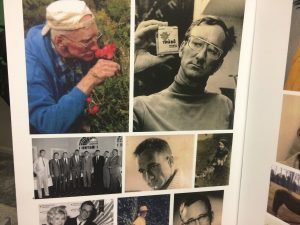 The memorial puja for the late Mr. Paget Sayers was held on 20th October at the Buddhist Library with the participation of Buddhist clergy, staff and many of Paget’s friends. 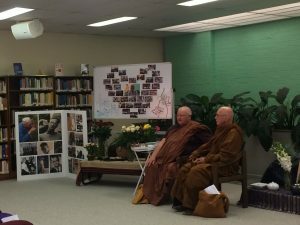 Youraid and Buddhist library would like to extend sincere gratitude to Bhante Tejadhammo and Ven. Pannyavaro for conducting the Buddhist puja. We also thank all the staff and friends who participated in the puja and helped us in numerous ways. We dedicated the merits of the puja to Paget. Paget Windeyer Sayers – Memorial Service Notice. 2 PM at the Buddhist Library. Buddhist ceremonies held in both Sydney and Cambodia to celebrate the life of Paget Sayers. Youraid would like to thank all of you for your kindness and dedication in celebrating the life of Paget Wideyer Sayers, the founder of Youraid, Buddhist Library and the Buddhist Library Cambodia Project. 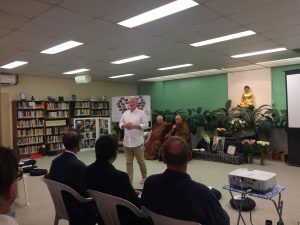 We would like to thank the Maha Sangha for conducting the Buddhist Ceremonies both in Sydney and Cambodia, consoling all of us during this difficult time after having lost a good person who was admired by all of us. Thanks to Bhante Tejadhammo of Association of Engaged Buddhists in Sydney for the puja conducted at the Sangha lodge in Sydney. Thanks to Sister Sudhira for conducting the special puja at the Buddhist Library at the time of Paget’s cremation. All these ceremonies showed how much all of us cared and respected Paget. We would like to thank Helene Pearl Scarf, Paget’s friend of 55 years and Karen Cassidy for looking after Paget for many years and especially the last few days of his life. Thanks to Seila Hort, Kin Pheap, Dr. Kim Yon and Chan Tuch and the BLCP staff for organizing the Buddhist ceremonies since from the day of Paget’s passing until the seventh-day Buddhist puja that was held on 5th October and attended by all from all three provinces in Cambodia. Thanks to directors of Cambodian provincial education ministries, Kep Gardens, CCAF and all those who sent messages of condolence. Thanks to the staff of Buddhist Library and Youraid for their support provided in organizing the Buddhist Puja at the Buddhist Library. Due to Paget’s abundance generosity may he quickly come to complete liberation of Heart and Mind which is Nibbana. NB: A service will be held at the Buddhist Library and the date will be notified later. Paget Windeyer Sayers – The founder of Buddhist Library, Youraid and Buddhist Library Cambodia Project. It is with great sadness that we announce that Paget Windeyer Sayers, 89, passed away peacefully on Saturday 29th of September in Bowral Hospital from lung cancer, with his carer and friend Karen Elise Cassidy by his side. Paget was a futurist and philanthropist and founded the Buddhist Library Camperdown and Project Cambodia in 2006, now Asia Aid Ltd, YourAid.org.au. Through his projects in Cambodia he has given fresh water, opportunities through education, and dental care to hundreds of thousands of children, benefiting their health, well-being, and opportunities. He prides himself in having 0% administration fees in all his charities, such that every dollar donated went directly to the children they intended to help. Through his kindness, compassion, and generosity, 8802 water tanks have been built, 121,000 children’s teeth have been treated, every day 2890 children receive advanced education to better their opportunities in life. Paget’s estate will continue to fund Asia Aid. He will be dearly missed by the Your Aid and Buddhist Library directors, staff, volunteers and the Cambodian people involved with BLCP over the last 12 years, Karen Elise Cassidy his carer and friend for 2 years, and Helene Pearl Scarf his friend for 55 years. His fellow Trustee, donor and companion of 55 years Ian Francis Murray died in 2014. 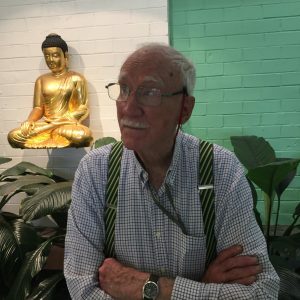 A public service will be held at the Buddhist Library Camperdown Sydney for all friends, donors, volunteers, staff and the many people whose lives he has benefited through his philanthropy. Details will be announced on youraid.org.au website. May we all as a community reflect on his merits and all the merits we have earned and dedicate these to lead Paget to a good rebirth and support him in his next life. May we all share in the merits gained, cultivate loving kindness and wisdom, culminating in the attainment of Nibbana, the cessation of all suffering. Thanks to our well-wishers and supporters who donated AUS $ 630,836 in the 2017/18 financial year. 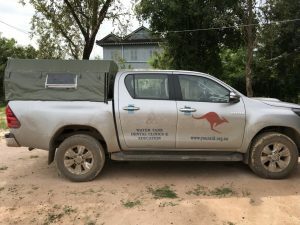 The majority of the donations were made by the estate of Paget Sayers, Chairman of youraid.org.au and the estate of late Ian Murray which amounts to 81%. While Paget is still with us today, his estate will continue in perpetuity to fund the project. You can help it grow by a bequest secure in the knowledge your funds will not be used for “Administration” but go direct to give Cambodian children a head start in life. Thank you very much for all the donors from Australia and around the world who donated generous AUS $ 90,645, a significant increase compared to the 2016/17 financial year. 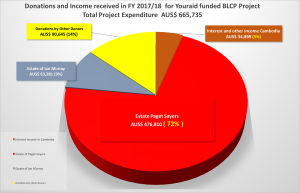 Youraid funded the Buddhist Library Cambodia Project to the tune of AUS$ 665,735 in FY 2017/18. There is a long way to go as we are planning to construct 180 huge rainwater tanks (equivalent to 10 smaller tanks of 2250 Ltrs) for 180 more schools in 2019. This will see all the primary schools (over 1034 schools that require water tanks) in the 3 provinces are equipped with rainwater tanks, a task we will be completing after 14 years. Our school count with water tanks now stands at 837 schools with 8802 water tanks. The raffle to raise funds for the three-classroom building for Steung Keo Secondary School has been drawn on 2nd September Dana Day at Sangha Lodge by the dear mother of Annie Low who will turn 100 shortly! Thanks to Association of Engaged Buddhists and Yet Lean Lee for organizing the raffle and everyone for your support. You have raised a grand total of $7,210 from the raffle. Altogether, Lean has been able to raise over AUS$30,000. 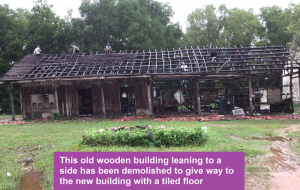 We are still short of approximately Aus$ 15,000 for the building and donations are welcome. Please go to our donation page to donate. Dentist to Volunteer for 2 months. 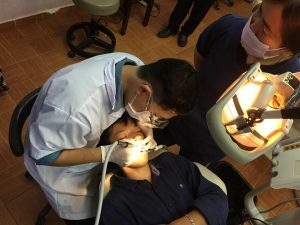 Recently graduated Dentist, Dr. Felix Han from South Korea has volunteered in our clinics including the mobile for over 2 months, the longest ever by a volunteer dentist. “Our skills and knowledge shouldn’t be used blindly as a simple tool of earning money. I never realized this clearly the fact that there are a countless number of people in our society needing our help. Help shouldn’t be limited to providing a dental service to the society, but some courage of sharing of your good qualities. As same as providing dental care to the children, I witnessed their enthusiasm and improvement after my short stint in teaching English. I strongly believe that the experience of being a volunteer at Kampot will forge me to become a better person than yesterday” said Dr. Han. Youraid likes to thank Dr. Han for his valuable time at our clinics. Our dental clinics are now known amongst the dental community in many western countries. 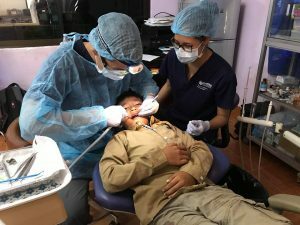 In the last few years, over 100 dentists, dental assistants from Australia, The UK, Scotland, Ireland, France, South Korea, and Germany have volunteered in our clinics. Sincere Thanks to Australian English Teacher, Lyn Quilty for the Great Workshop! All of BLCP English teachers learned new teaching techniques. Lyn is a retired and volunteer English teacher from Perth, Australia with many years of experience. 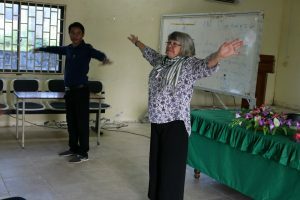 She taught English and trained teachers in Vietnam and Cambodia for the past 7 years. Recently, she conducted a useful training workshop for all BLCP English teachers from Kampot, Kampong Speu and Takeo provinces. It will be very helpful for their teaching career. Colgate Supports our Dental Clinics. 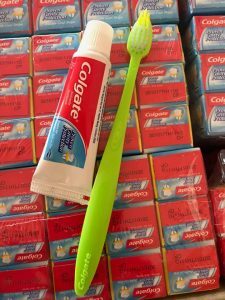 Clinics receive 10,040 kits of toothpaste tubes and toothbrushes. 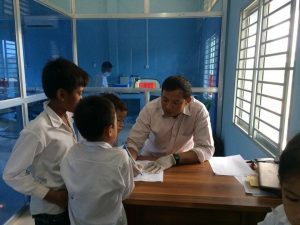 Thanks to our new dentist of Takeo clinic Dr. Menh Kinh, school children treated at our clinics received 10,040 kits of toothpaste and toothbrushes. “It’s my greatest gratitude to Your aid and BLCP (that assist Cambodian School children) for giving me an opportunity to work for this wonderful project. I am trying my best under Dr.Kim and Mr. Kin Pheap, our Country manager of BLCP to do a good job with quality. I will find time to meet Dr. Keang Seng, a Colgate dentist, and show him BLCP objectives in improving kids dental care. I hope he will agree and submit our objectives to Colgate New York for future co-operation, as they also implement their project called Bright Smile Bright Future. I hope to be a partner with it ” said Dr. Menh Kinh. Youraid likes to thank Colgate and Dr. Menh for this valuable contribution. 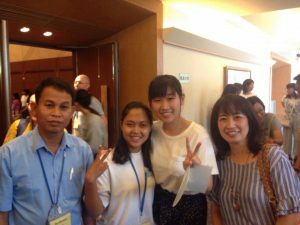 BLCP English Student Svay was chosen to represent Asian and Oceanian High School Forum 2018 in Japan. Seavmey Svey studied at the BLCP English classes at Beong Touk school for 4 years from the Beginner to Pre-Intermediate level. She is from a farming family and Jasmine Club 500 sponsored her studies. Recently, she was selected to visit Japan as a result of her excellent performance at a competitive exam in English medium. This exam was conducted by the Ministry of Education where 30 students from other high schools in Kampot province participated. Youraid likes to congratulate both Svay and her BLCP English teacher for this achievement. We thank all our donors for supporting our Education project. Every day our 148 FREE classes teach over 2,892 children English, Computer usage, Mathematics and Khmer Language. These classes are taught by 60 teachers. Our New Takeo Clinic Gets a New Hi-Lux. 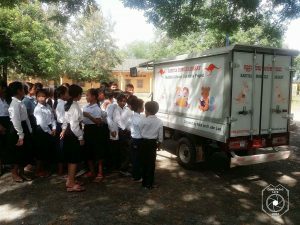 Over 50,000 school children in 168 schools in Takeo will get transport for FREE dental care. BLCPs 4th Dental Clinic for children started on the 5th of June 2018 has performed extremely well in the last 2 months and all the children of the nearby schools were screened and treated for dental ailments. Time has become ripe to extend the services to the distant schools where children can not make their own trip to the clinic. Hence, a new Hi-Lux with a modified tray is now being deployed to transport kids. Takeo clinic will provide FREE access to dental care for over 50,000 kids in 168 schools. With this new clinic, Youraid will increase the number of kids treated at our 4 clinics including the mobile to 2,000 a month. 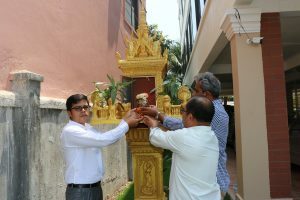 Buddhist Library Cambodia Project gets 4th Dental Clinic. Over 50,000 school children in 168 schools in Takeo will have access to FREE dental care. BLCPs 4th Dental Clinic for children located at Cham Bok PS in Batie district in Takeo province was opened ceremonially on the 5th of June 2018. This clinic will provide FREE access to dental care to over 50,000 kids in 168 schools. With this new addition, Youraid will increase the number of kids treated at our 4 clinics including the mobile to 2,000 a month. We would like to extend our sincere gratitude to all Australian donors including the Australian dentists Dr. Matthew Foo who donated 2 dental chairs, Dr.Helen Kijvanit of All Care Family Dentist, Fairfield and Dr. Li-Yong Ling of Comfort Dental Care Baulkham hills for autoclaves and ADEC for logistics of uninstalling and packing. We take this opportunity to thank the Department of Education and the Department of Health of the Takeo province for their support. Last but not the least, we like to thank our staff of Buddhist Library Cambodia Project who tirelessly worked to establish this clinic within a short period of 3 months. This fundraising raffle is jointly organized by Youraid and Association of Engaged Buddhists Sydney. 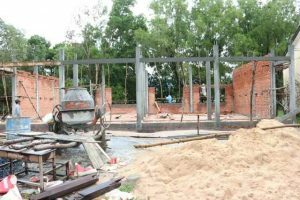 Proceedings will be used to build new classrooms for Steung Keo Secondary School in the Kampot province in Cambodia. Tickets are priced at $5 and, you can win great prizes while contributing towards the building project of the school. 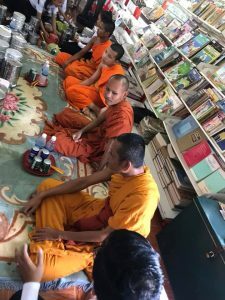 The Mobile Computer Classes under Buddhist Library Cambodia Project started in December 2017. Anna’s idea was very simple. One teacher + one motorbike + 10 laptops = computer education for more than 300 kids in a year. The teacher travels on a bike to remote areas where kids wouldn’t have seen or used a computer before. We started at 2 schools: Rong Chak (approx. 20 Km from Kampot) and Chbar Ampov (15 km from Kampot). A few weeks ago, the first batch of 60 students finished the course. They sat for a practical test and received a certificate. In the first round, kids learn how to touch type in English and Khmer, use Microsoft Word, Excel and other basic computer skills focusing on Microsoft Windows. “In the second round, they are paired and they can exchange knowledge and also support and motivate each other. They enjoy working in pairs and learn very fast with this approach,” said Anna. Thanks, Anna and her friends for this wonderful project. – Australian Volunteer Jasmine Durbidge of Club 500. Jasmine has been supporting BLCP education projects, especially our mobile libraries with her group CLUB 500 in the last 3 years. Club 500 has completed a number of additional projects including – wash and tooth brushing facilities at remote schools, 2nd hand laptop donations, building a preschool in a remote province, mobile computer classes, new houses for poor families, reading glasses for students, and their yearly Christmas Bike and Food Package. “I have so many memorable moments as a result of my involvement with BLCP. Traveling for hours in tuk-tuks on red dirt roads wondering where on earth we could be going only to arrive at remote schools and villages in places that you most certainly would not find on a map. Making lifelong friends, who I affectionately refer to as my Cambodian family and sharing my Cambodian experiences with family and friends and having some of these people visit Kampot with me and see first-hand the difference that we can make by all working together, are a few to be mentioned. 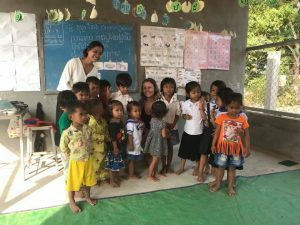 Above all, BLCP has an amazing staff in Cambodia who works tirelessly to make a difference in the lives of the Children” says Jasmine. Thanks, Jasmine and CLUB 500 for your support in the last 3 years. Celin volunteered for 5 months in our English classes and mostly with the mobile library managed by our librarian Nuon Chanthol. “ I was really glad to share Chantol’s experience and read books to the children. I have been to Mr. Suon Vanna’s English class many times to read books and talk with the students. Once I have met all BLCP’s librarians for an interesting training day. They all love their job and work hard to promote reading. BLCP helps the children to have a better knowledge and education to improve their future. Hope I can come back next year” said Celin. 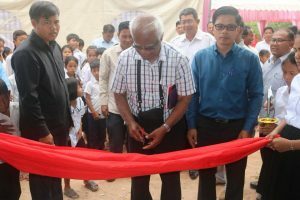 An unused school building in Takeo province is currently being remodeled to a fully-fledged dental clinic at a cost of US$9736. This is our 3rd permanent dental clinic for the children. Youraid would like to thank Australian dentists Dr. Mattew Foo who donated 2 dental chairs and Dr. Helen Kijvanit of All Care Family Dentist Fairfield and Dr. Li-Yong Ling of Comfort Dental Care Baulkham hills for autoclaves for the use of the new clinic. All the instruments were refurbished and certified in Australia. Once the clinic is commissioned in May 2018, over 50,000 kids in168 schools in Takeo Province will have access to FREE dental facilities. This will increase the number of kids treated at our 4 clinics including the mobile to 2000 a month. “You cannot get a decent job with bad teeth”. Two School Buildings Opened in Two Weeks. 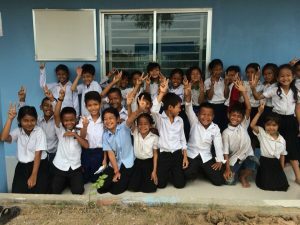 Thanks to Australian donor Yet Lean Lee, Alex, and her friends, a brand new 2 classroom building was donated to Boeng Touk Primary School. 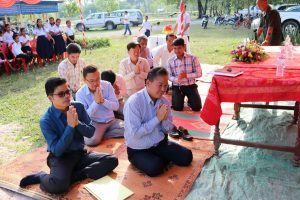 The new building was declared opened by Provincial Director of Kampot Province on 14th December 2017. 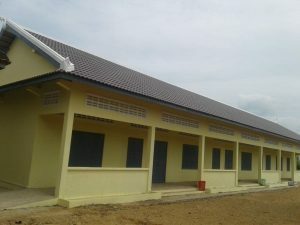 This new school was constructed by YOURAID funded Buddhist Library Cambodia Project (BLCP) at a cost of US$22,000. UNTIL yesterday children have had classes in a very old, falling apart wooden structure. From now on, lucky Kindies will have classes in this brand-new school building in the morning and the school will be used for BLCP Non-Formal classes in the afternoon. With this new addition, YOURAID has so far built 3 buildings of 10 classrooms that include Ranaridd High school and Murry School in Kampot province. Also, we jointly contributed to the construction of 3 more school buildings. 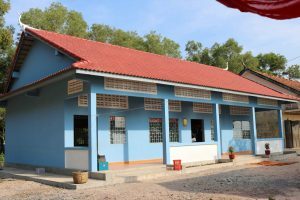 A brand new 5 classroom building was declared opened by HE Soem Vuthea, Deputy Governor of Kampot Province on 7th December 2017. This new school is a joint project of YOURAID funded Buddhist Library Cambodia Project (BLCP), Sipar and Kinal Foundation. UNTIL yesterday children had classes at very old, falling apart 2 wooden structures. Lucky kids will now have classes in this brand-new school building. In 2009, Following the request of the principal, we donated one classroom building to the same school where the library is now functioning. YOURAID has so far built 2 buildings of 8 classrooms for Ranaridd High school and Murry School in Kampot province. Also, we jointly contributed to the construction of 3 more school buildings. Wow! 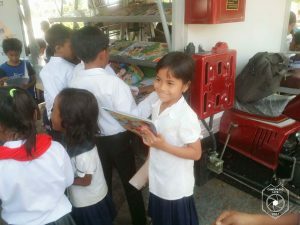 Thanks to Australian donor Yet Lean Lee, her friends, and relatives for donations for our 3rd TUK TUK mobile library named as Karuna Mobile Library. These generous Australians donated further funds to run the library for one year. It will visit between 20 – 30 schools in a month reaching between 2,000 to 3,000 kids. Thanks to all our donors, by the end of September 2017, we have been able to build 8535 water tanks including 50 big 20,000 Ltr tanks. Thanks to Aussie Donor Yet Lean Lee, Boeng Touk Primary school will have a new 2 classroom building very soon. 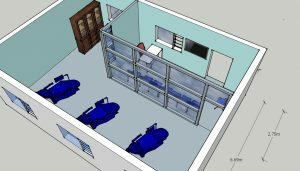 Lean hopes to raise enough funds for this US$22,000 brand new school with a tiled floor and glass louvers. Constructions started in early September and the school will be ready to operate in mid-November. 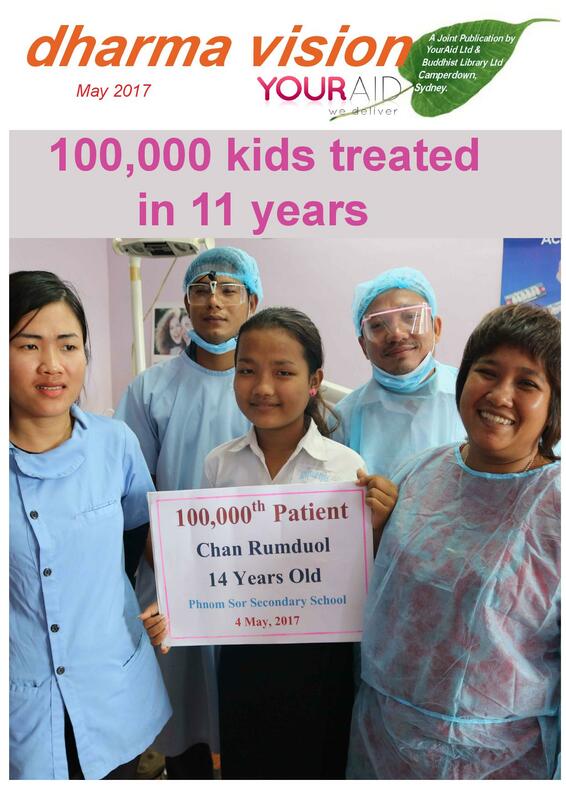 Chan Rumduol of Phnom Sor Secondary School is lucky as other 99,999 school children of 3 provinces treated at our 3 free dental clinics including the mobile. Thanks to our dental staff led by Dr. Kim Yon for this great achievement. We also thank over 150 overseas volunteer dentists and dental therapists worked in our clinics. 1. Our 2 clinics were established in 2006 by Australian dentist and youraid director Dr. Cecilia So. 2. Our first mobile clinic has been donated by Dr. Serge Bodlander and late Ian Murry. 3. Our first brand new dental chair has been donated by volunteer Dentist Dr.Stassen Lieve. 4. The first mobile X-Ray machine is a donation of the Australian Dentist Dr. Steven Cohn. Rain Water Tank Project – We are heading to build 9000 tanks by the end of 2017. 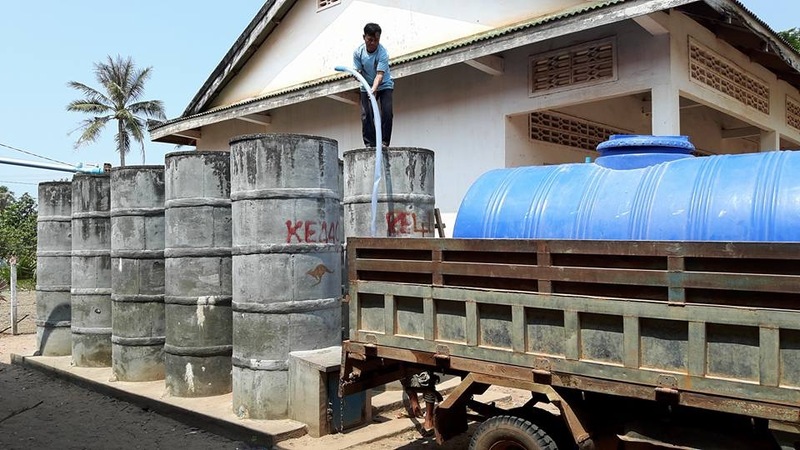 By the end of July 2017, we have been able to build 8445 water tanks including 40 Huge tanks of the capacity of 20,000 Ltrs, in five provinces including Kampot and Kampot Speu provinces. These water tanks provide fresh water for over 355,428 children for the first time in their life, a huge health plus. Due to the growing demand for dental care, our three dental clinics, including a mobile clinic have now treated 103,885 children since they began. Our dedicated dental staff has now performed 33,642 tooth extractions and 1052 root canal fillings to date. The dental records now stand at around 90,757 cases of restoration and 55,865 cases of prevention that our staff attended in those clinics. Our very generous dentists, along with the volunteers are able to treat more than 1500 children a month. While kids are waiting for dental treatment, our clinic staff conducts eye checks too. So far, our staff has checked the eyes of 2086 kids. It was found that 4 of the kids have eye problems. We are planning to direct them to an eye clinic in Phnom penh where the cost of treatment will be borne by Buddhist Library Cambodia Project. We conduct 96 English classes for 2,470 students. These classes are facilitated by 42 teachers. 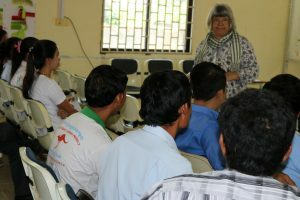 Computer classes are expanding into various regions of Cambodia. By the end of July 2017, we have had 295 students in the 40 computer classes that have been established. We now have 10 non-formal schools under our care with 285 children. Not only building of water tanks brings good health and hygiene to our kids, but also toilets and hand washing facilities. 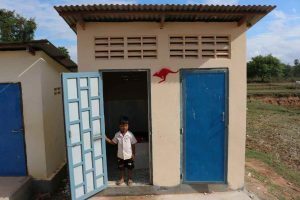 In February 2017, we built a twin toilet for Ang Lbeuk Public School and hand washing facilities at Beong Touk Public School, Tuol Ponley Public School, and Wat Kampot Public School. So far we have built 27 toilets and 17 hand washing facilities. Thanks to all our donors for your donations. Rain Water Tank Project – We achieved our target of 8000 water tanks and heading to build 9000 tanks by the end of 2017. By the end of January 2017, we have been able to build 8200 water tanks including 15, 20,000Ltr Huge tanks in five provinces including Kampot and Kampot Speu provinces. These water tanks provide fresh water for over 346,999 children for the first time in their life, a huge health plus. Due to the growing demand for dental care, our three dental clinics, including a mobile clinic have now treated 96,014 children since they began. Our dedicated dental staff has now performed 31,680 tooth extractions and 913 root canal fillings to date. The dental records now stand at around 82,138 cases of restoration and 50,885 cases of prevention that our staff attended in those clinics. Our very generous dentists, along with the volunteers are able to treat more than 1500 children a month. We conduct 93 English classes for 2,334 students. These classes are facilitated by 41 teachers. Computer classes are expanding into various regions of Cambodia. By the end of January 2017, we have had 291 students in the 41 computer classes that have been established. We now have 9 non-formal schools under our care with 253 children. A shocking drought is sweeping across Asia and governments desperate to help. We knew at Buddhist Library Cambodia Project the predecessor to YOUR AID, if we built tanks at all schools when the drought came, we would have a place to store water as well as harvest rainwater. We see in the picture Cambodian government delivering water to our schools for all the village as well as kids while waiting for the monsoon to break. It is vital people avoid wells with heavy metal and even arsenic especially built by well-meaning charities, excuse the pun but serious. As if our sisters and brothers didn’t have enough to worry about in Asia there is the horror of accumulated poison from the use of weedicides and Pesticides on rice crops. In Sri Lanka alone thousands are dying of kidney disease with the government buying many dialysis machines in an attempt to try to fight against this silent but stealthy killer…. a 50-year problem. Rain Water Tank Project – We achieved our target of 7500 water tanks and heading to build 8000 tanks by the end of 2015. By the end of May 2015, we have been able to build 7554 water tanks in five provinces including Kampot and Kampot Speu provinces. These water tanks provide fresh water for over 319,306 children for the first time in their life, a huge health plus. Due to the growing demand for dental care, our three dental clinics, including a mobile clinic has now treated 70,306 children since they began. Our dedicated dental staff has now performed 25,115 tooth extractions and 629 root canal fillings to date. The dental records now stand at around 58,332 cases of restoration and 23,476 cases of prevention that our staff attended in those clinics. Our very generous dentists, along with the volunteers are able to treat more than 1000 children a month. We conduct 104 English classes for 2,461 students. These classes are facilitated by 43 teachers, including 2 classes for recently opened for bright students, enabling them to receive extra tuition. Computer classes are expanding into various regions of Cambodia. We have started one more Computer class at the Seray Theany Primary School. By the end of May 2015, we have had 302 students in the 45 computer classes that have been established. We now have 8 non-formal schools under our care with 215 children.